So, Sam Walyaula arrived in the UK on Friday along with Jane, the teacher visiting Treorchy Comprehensive School. Mr Mansfield and I were very excited to travel down to collect them both as we have missed them greatly since meeting them in half term. In the meantime, Sam had taken the opportunity of being given a tour of some of London’s sights and by the time we met him, he was able to take advantage of being in London and see some of the UK’s capital city. He visited the Houses of Parliament, the Horseguards’ Parade and even Buckingham Palace! He told us that he was surprised how busy everything was and said that the strangest thing he had seen was the escalator which he found very difficult getting on and off! As Mr Mansfield and I arrived, he was exhausted but delighted to see us. Despite his 26 hour journey (via Dubai! ), Mr Walyaula was very keen to catch up with us and we chatted the entire journey (in heavy Friday evening traffic!) back to Cardiff. He told us all about the pupils we had got to know during our time in Uganda and said that the school had managed to paint 6 more blackboards since we left, using the paint we bought at the local DIY store. The teachers had also been working hard to draw their resources onto hessian bags ready to put up on the walls in the classrooms. Mr Mansfield and I were delighted to hear that some of the things we had left had been put to use already. As we got back to Newport, Mr Mansfield realised that he had left his shoes in school so we had to stop by to pick them up. This gave Jane and Mr Walyaula a chance to see our school building although, sensing they were too tired for a full tour of the building, we only stayed briefly. By the time we arrived back at Mr Mansfield’s house, it was getting late and, having dropped Jane off in Cardiff Bay, we thought Mr Walyaula would be ready for bed. His excitement at seeing Mr Mansfield’s flat had, however, given him a new burst of energy and he jumped at Mr Mansfield’s suggestion of looking at all the photos and videos in our blog! Whilst we have looked at these many times, Mr Walyaula had never seen them before so he was fascinated to see them on our website. Finally, after much laughter, Mr Walyaula was ready for bed and headed off to sleep. Saturday began with an all-you-can-eat cooked breakfast at Tesco. 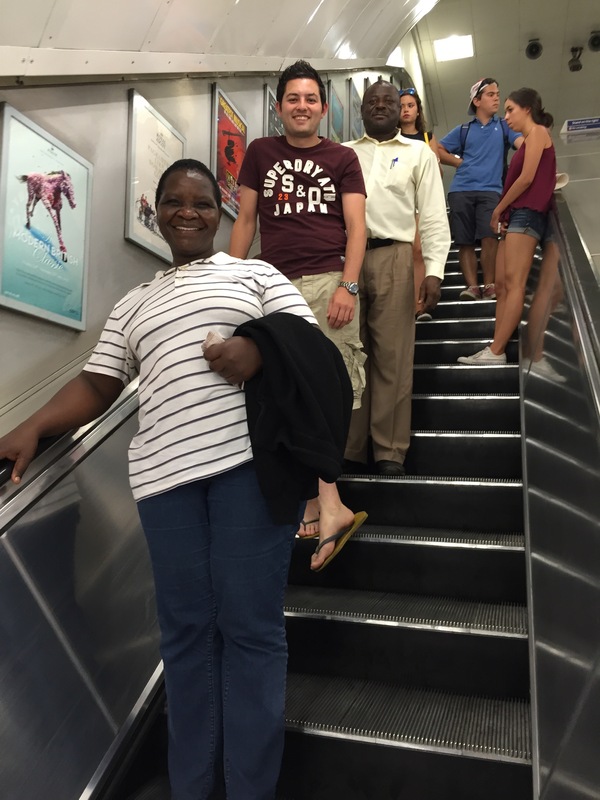 When we arrived, Mr Walyaula managed negotiate the escalator very carefully as we made it to the cafe! He was fascinated by some of the food on offer! He particularly liked the sausages although asked if the bacon was supposed to ‘taste very salty’ and would not try the Black Pudding after I told him how it was made! I had a flashback to the gizzard and cow’s intestine but decided to remain quiet and let him choose more of what he wanted! Having all fed well, we set off to St Fagans to show him what life in Wales has been like through the ages. We met up with the teachers from Treorchy Comprehensive School who had bought Jane with them. Mr Walyaula seemed to enjoy seeing all of the old houses and even managed to sample some scones with jam and cream as we explored the museum. 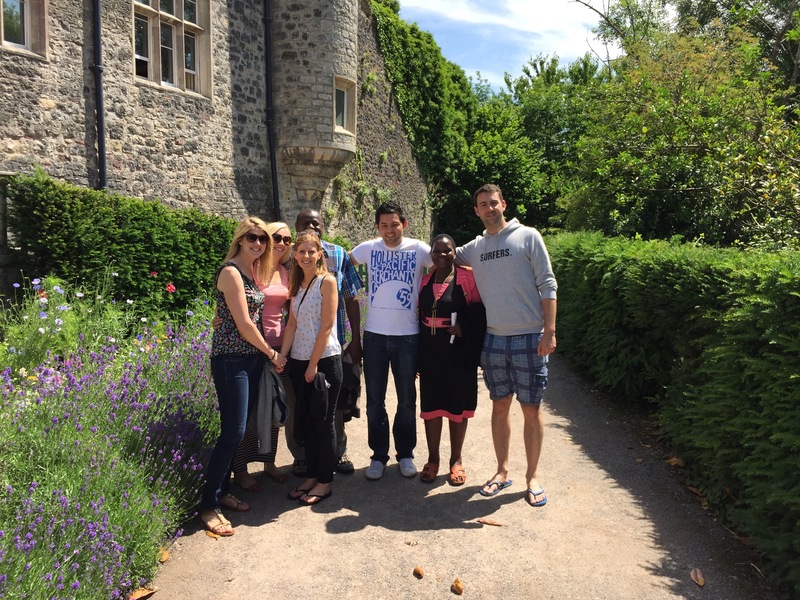 From St Fagans, we all headed to Cardiff Castle where a festival of Welsh language was happening. 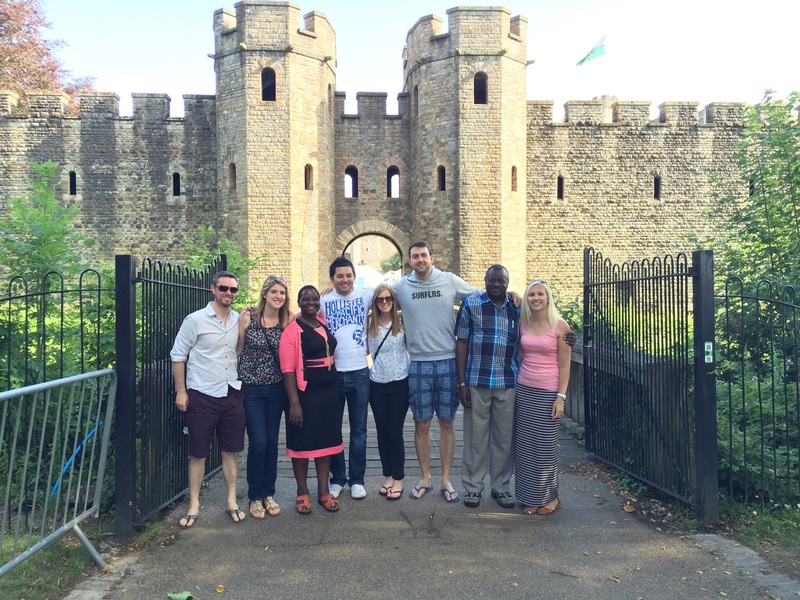 This was a good chance to show Mr Walyaula around the castle. It was very busy but he was interested to hear about the history of the castle and move around some of the tents that were around, sampling delights such as cheese, cookies and crisps. To say he was not fond of some of the chutneys on offer would be an understatement! Following the castle, we all headed over to Bute Park for a BBQ. Mr Walyaula had been telling us how, traditionally, it was the women who did the cooking in Uganda but, seeing the disposable BBQ, he volunteered to cook our food for us. Between him and Mr Mansfield, they quickly cooked up a storm. 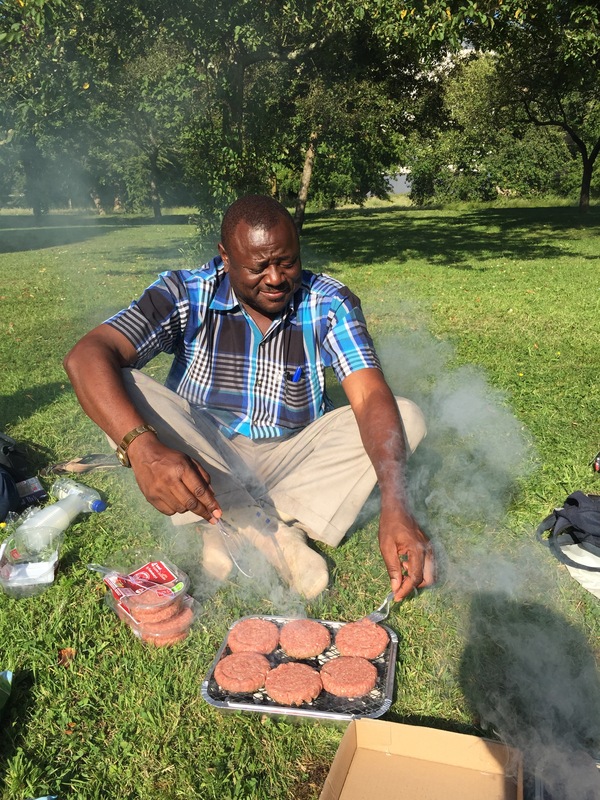 Mr Walyaula was a natural at cooking on the BBQ and his burgers were far tastier than Mr Mansfield’s sausages. He seemed genuinely proud of his cooking and enjoyed being able to provide us with our food. It had been another long day but, before heading home, we stopped at one of the Treorchy teacher’s houses for a quick cup of tea as we then all headed our separate ways to bed. Mr Walyaula said he was very much looking forward to some sleep. As I awoke on Sunday morning, I had a call from Mr Mansfield to say that Mr Walyaula had woken him up to say how excited he was about attending church. 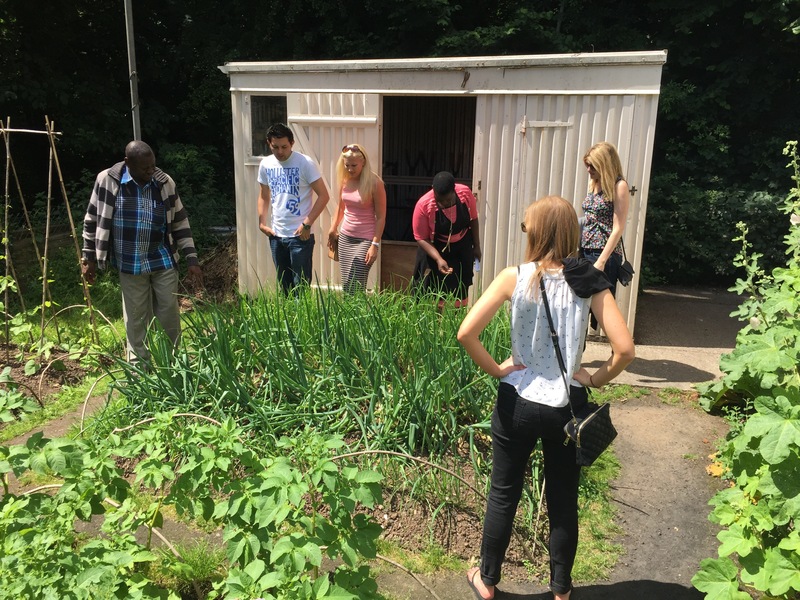 Going to church is a very big part of Ugandan life so we had arranged for him to go to the church of one of the Treorchy Comprehensive School teachers. He dressed himself very smartly before we all went together. Mr Walyaula was warmly welcomed at the church and was introduced to the others in attendance with a warm round of applause. He seemed to enjoy the service although, as with the service we attended in Uganda, he commented on how differently things were done. After church, we had very kindly been invited to Mr Rees’ house for Sunday dinner. 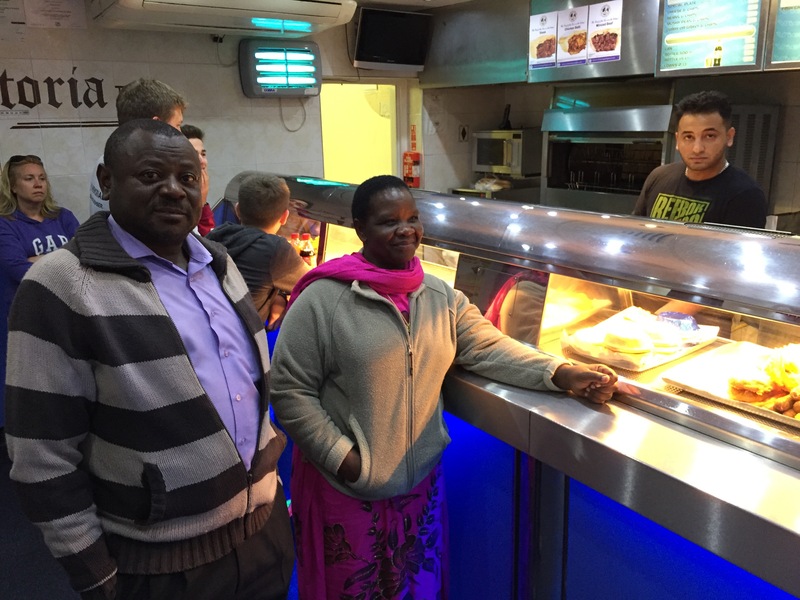 Mr Rees and his wife put on a very nice spread and Mr Walyaula was delighted to meet the Headteacher of our school. He said what an honour it was and it was great to see how well they got on. They enjoyed talking about the similarities and differences between their jobs, finding that many things were similar even though they worked thousands of miles apart. Mr Walyaula particularly enjoyed learning about traditions in the UK and was fascinated by how much people care for their pets! The afternoon flew by with everyone chatting about Uganda and Wales and before we knew it, it was time to head off. As we left Mr Rees’ house, we headed to Ogmore beach for a walk around. 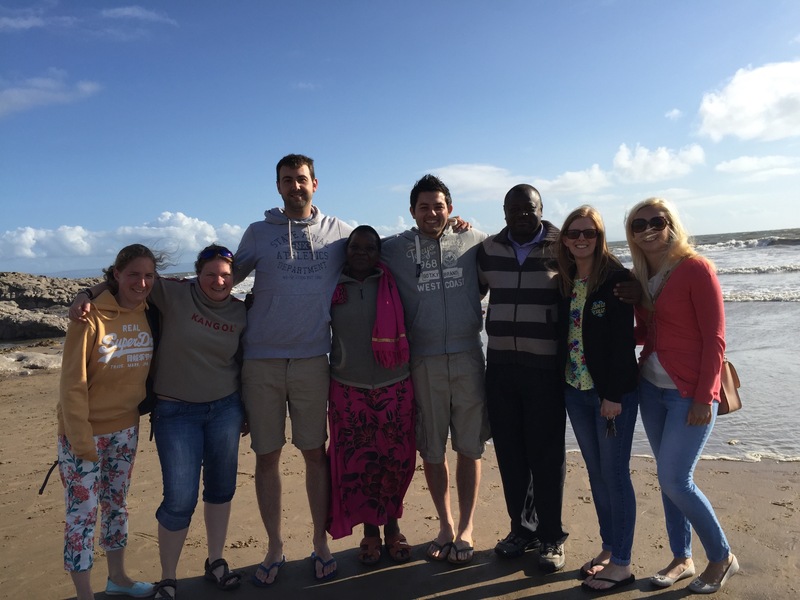 Mr Walyaula had not been to a beach before and had never seen the sea so this was quite an experience for him. He was fascinated to see people swimming in the sea and wondered why people would do it and whether it was safe! He was even more intrigued as someone started heading towards us on a surf board! After a nice walk along the beach, we offered Sam the chance to have some fish and chips before we headed back home. He loved the fish but, most of all, he enjoyed the chilli sauce that they offered him to taste in the chip shop! After ordering a whole pot, we headed back to eat the fish and chips at home before going to bed. As I left Mr Mansfield and Mr Walyaula, he told us he had enjoyed his experiences this weekend but that he was excited to wake up tomorrow and finally get the chance to come to our school. Hopefully he will sleep well tonight as I am sure he will need all his energy as he meets the amazing children and staff of St Julian’s Primary in the morning!